Odor Description: Green, Herbaceous, Vegetable. In the sauna, the Scandinavians traditionally use birch twigs to stimulate the blood circulation. 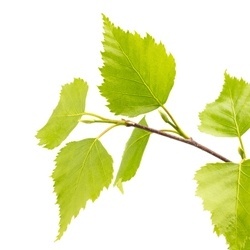 The characteristic fragrance of heated birch leaves in a sauna bath was studied using a multidimensional analytical process carried out by the research department at Givaudan. The results enabled them to create Birch Leaf Givco 166. This product is specially recommended for use in 'back-to-nature' concepts and for providing original freshness. Use Level: Up to 20%; 2% adds a modern touch to masculine colognes and up to 3% brings a typical herbaceous/vegetable effect to shampoo and beauty care products.